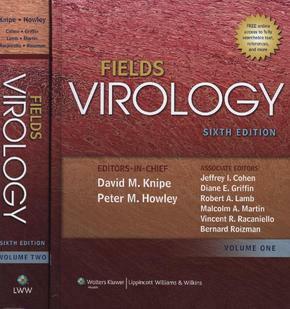 Established for 20 years as the definitive virology reference, the two-volume classic Fields Virology is in its thoroughly revised, updated Edition. More than 100 world-renowned investigators provide encyclopedic coverage of every aspect of contemporary virology, including the pathogenesis of viral diseases and the molecular biology, replication, and clinical significance of all known virus families. This edition has many new international contributing authors and a greater emphasis on clinical relevance. Coverage includes new material on viruses and biodefense, emerging and re-emerging viruses, the human virome, mononegavirales, and henipaviruses. This edition also has a new two-color design and a revised art program unifying replication and virions images. A new bound-in CD-ROM contains a viral image bank.